Aelred had a charism for chaste spiritual friendships. When he was abbot at Rievaulx There were over three hundred monks there. 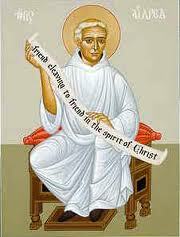 Aelred was an Anglo-Saxon, born in Hexham, Northumbria, in 1110. His father, a married priest, sent him to the court of King David I of Scotland to be trained as a courtier. Aelred rose to be Master of the Household before leaving to enter a Cistercian monastery at Rievaulx Abbey, in Yorkshire, around the year 1134. He became the abbot of a new house of his order at Revesby in Lincolnshire, and later, abbot of Rievaulx itself in 1147. As abbot he had a charism for friendship and Rievaulx had over three hundred monks when he died. Aelred also made annual visits to other Cistercian houses in England and Scotland, and to Citeaux and Clairvaux in France. These visits may have damaged his health, as he suffered from a kidney disease and died at the age of fifty-seven on 12 January 1167. There seems little doubt that Aelred was homosexual by inclination, but he seems to have been able to transcend his physical desires and when he became a monk was able to cultivate chaste spiritual friendships. He also developed a theology of friendship, based on the intimacy of relationships between the persons of the Trinity. Just as there is a continuous dialogue and interchange of love between the three persons of the Trinity, so human beings – the rational creatures made in the image and likeness of this Trinity of Persons – are called to relationships based on mutual dialogue, exchange, sharing and self-giving. 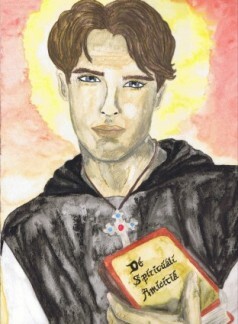 Aelred wrote several influential books on spirituality, among them The Mirror of Charity (perhaps at the request of Bernard, Abbot of Clairvaux and Spiritual Friendship. He also wrote seven works of history, addressing two of them to Henry II of England, advising him how to be a good king and authenticating him as a true descendent of the Anglo-Saxon kings. Until the twentieth century Aelred was known more as a historian than a spiritual writer; because of his Life of Saint Edward, King and Confessor.